Road Town is the capital of the British Virgin Islands and is the main hub for business and the marine industry. Underneath its tropical exterior the town is a hive of activity with government buildings, shops, restaurants, hotels, charter operations, cruise liners and many financial buildings catering for the demand of offshore banking. Old wooden framed buildings and bright red roofs gives the town its historic charm while the brightly coloured shops and plazas with designer shops, bars and restaurants make this a busy modern capital city. 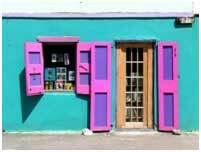 The town has something for everyone and provisioning here is easy with so many shops to choose from. J.R. O’Neal Botanical Gardens was founded in 1900 as an agricultural research center. In 1985 Margaret Barwick, the wife of a former governor, and J.R. O’Neal, a local environmentalist, had the original ideas for this spectacular 4 acre tropical delight. Wander through the palm tree walkways and see the great displays of lush plant life including prickly cacti, hibiscus, fruit trees, Banyan trees and other BVI flora. Large pavilions make a great hot environment where ferns and wild colourful orchids bloom. Relax on the benches placed around the beautiful peaceful lawns, stroll through the miniature rainforest and listen to the trickling sounds of the cast iron water fountain surrounded by lilies. Other attractions at the gardens include tropical birds and the beautiful and exotic red-legged tortoise with its multi coloured spots. Fort Burt was first built by the Dutch around 1700 and was named in 1776 after William Burt, Governor of the Leeward Islands. 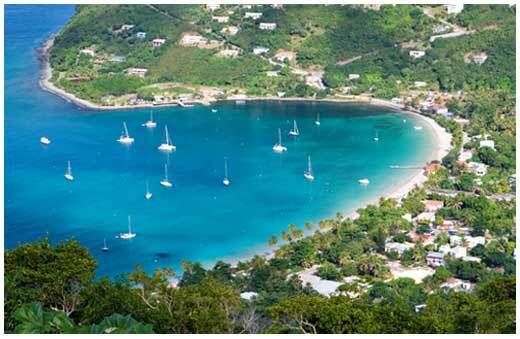 It sits on the Southwest edge of Road Town and was the first fort to be built on Tortola. Later it formed part of the defensive fort network built in the surrounding hillside including Fort Road Town, Fort George and Fort Charlotte, all constructed to protect Road Town and its harbour. In 1953 Commander Christopher Hammersley and his wife acquired the fort and converted it into the only hotel on the island at that time. Today it is owned by the Pusser’s Chain and they welcome all visitors to their luxury hotel and restaurant. Most of the original structure is no longer visible but one original cannon has survived and is placed on a veranda overlooking the harbour. Sage Mountain National Park was declared a park in 1964 and offers good hiking trails. 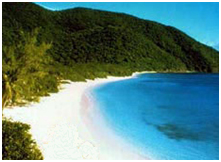 The park is around 92 acres and runs east to west along the spine of Tortola. The park boasts the highest peak in both the U.S.V.I and B.V.I's and rises 1716 feet above sea level. There are various nature trails that you can hike along and they will take you through the lush emerald green forest terrain with fascinating plants and trees such as the Elephant Ear Vine, Mahogany plantations, white cedar trees and the Bulletwood tree that reaches up over 100 feet tall. Listen to the gentle cooing of the mountain doves and glimpse the black and white Caribbean Martins as they feed on the berries and fruits on the trees. Looking up into the clear blue sky you will see American Kestrels hovering overhead, waiting to spot their prey. On the edge of the mountain you can relax and take in the views of the surrounding islands. The Valley is the southern sector of Virgin Gorda and is very flat. The Valley has many interesting landmarks such as Spanish Town, The Baths, the ruins of the Copper Mine, Little Dix Bay and the Yacht Harbour. Spanish Town is the main commercial center of Virgin Gorda and is more of a small settlement than a town with most of the islanders living here. The town is set in the Valley along the Lee Road and has its own small airport and ferry service. The main development of the town took place after 1960 when the Yacht Harbour resort was built and now has shops, restaurant and bars to entertain cruisers. Originally the town was used by the Cornish Miners who were mining copper and before 1714 it was the capital of the BVI. Little Fort National Park is located just south of Yacht Harbour. The wildlife sanctuary is approximately 36 acres and set on the hillside you will find the remains of an old Spanish fortress. Gorda Peak National Park was set up in 1974 when Lawrence Rockefeller donated the land to the National Park Trust. The peak rises 1370 feet above sea level and is one of the highest points of the British Virgin Islands. The 265 acres of dry forest is home to some of the rarest plants found in the Virgin Islands and as you hike through the forest you will see the lush green trees and six types of colourful native Orchids. The animal life is just as vibrant as the tropical vegetation with three types of frogs, soldier crabs, snakes and many reptiles. Keep a look out for the world’s smallest lizard, the Virgin Gorda Gecko. Look high into the treetops and you will find several species of birds and bats. Once you reach the top you will find a wooden look out tower that gives you the most spectacular views of the surrounding islands. Old Copper Mine is located on the Southeaster tip of the island at Coppermine Point. The Dutch discovered the island had copper ore in the 17th century and in 1837 the British sent over 36 Cornish miners to mine the ore with 140 British Virgin Islanders. For 24 years the ore was mined and sent to Britain where the ship was filled with provisions, coal and wood for its return journey. The site was abandoned in 1862 and today is a national park area and the remains of the original chimney stack, cistern and mine shafts can be seen. The Shaft is said to be over 247 feet deep which would be below sea level. Plans were drawn up by the Copper Mine Committee and the National Park Trust to have the site re-constructed but the plans have never been implemented. Standing at the site you have a great view of the ocean. Callwood Rum Distillery on the Arundel Estate is the oldest, continuously operated distillery in the Eastern Caribbean, dating back four hundred years. For the past two hundred years the distillery has been passed down from generation to generation of the Callwood family, who still operate it today. Located in Cane Garden Bay the distillery provides history and culture with the original stone buildings and the original boiler still in operation. 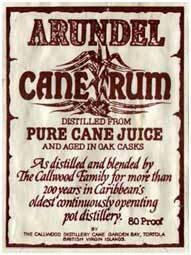 Old traditional methods are used to make the rum and the sugar cane is locally grown. The cane is pressed and the juices are collected and boiled, water is added and then the mixture is put into wooden casks to ferment for around 10 days. After the 10 days the mixture is re-boiled and the alcohol is collected and left to age for approximated four years. The original oak casks are still used for dark rum and demijohns are used to store white rum. You can purchase the rum at the on site shop and it is a great way to stock up before you set sail. The Settlement or Village is the main residential area for the Anegada islanders. The settlement offers a few restaurants, a bar, bakery, grocery store, police station and post office. The settlement has the remains of old stone walls that create enclosed fields. The Walls were used in previous generations when agriculture was important; however, today the main industry for The Settlement is fishing. Flamingo Pond is the largest of the four salt ponds on the island and covers most of the western side of the island. In the 1830s the ponds were home to thousands of Caribbean Flamingos but unfortunately throughout the 19th and early 20th Century these magnificent birds were hunted for meat and their brightly coloured feathers. In 1992 they were re-introduced to the island and are now being protected so that the species can flourish, for this reason charterers are asked not to disturb the birds. Eating out is a must as the lobster, conch and sea food is known to be the best in the Caribbean. The bars offer a help yourself policy where you write down what you have and pay at the end. You will find the islands restaurants rotate the night they are open so that everyone can earn a living. The Lobster Trap, Pomato Point restaurant, Whistling Pine, Neptunes Treasure, and Anegada Reef Hotel are to name just a few restaurants on the island. If you are looking for some home made provisions you will love Pam’s Kitchen. At 5.30pm a dinghy will go around the anchorage offering freshly baked bread, cinnamon buns, blueberry muffins, cookies, pies, jams, salsa, hot sauces and so much more. If you miss the rounds you can find the kitchen at Neptune’s Treasure Compound. Loblolly Bay is an incredibly beautiful bay with the most amazing white sand beach and is a fabulous place to relax as it is un-crowded. The waters are electric blue and the snorkeling and diving just off shore are some of the best in the Caribbean. The fish shimmer as they reflect the sunlight and you will find such a wide variety of marine life that you will want to snorkel forever. The Big Bamboo beach bar is located on the beach and is a great place to have lunch and sip a few refreshing beers. You can not sail to the bay so the best way to get there is by taking one of the local water taxis.